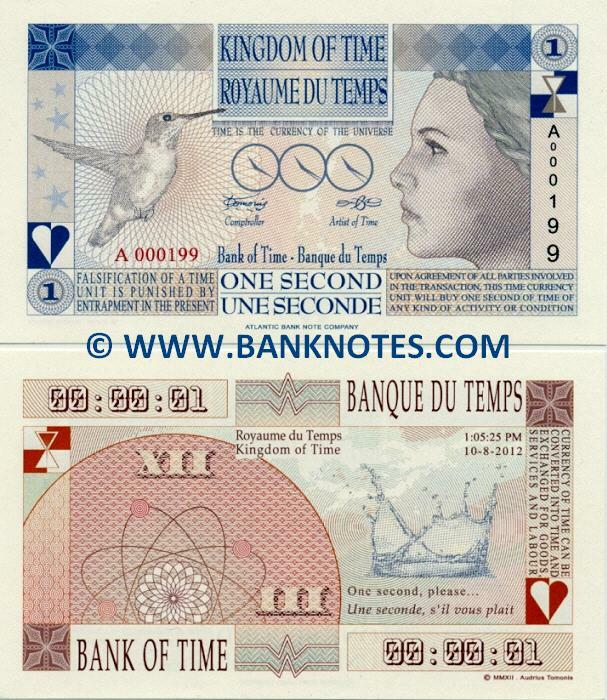 Kingdom of Time 1 Second 2012 - Time Currency Notes, Paper Money, World Currency, Banknotes, Banknote, Bank-Notes, Coins & Currency. Currency Collector. Pictures of Money, Photos of Bank Notes, Currency Images, Currencies of the World. Front: Woman and a hummingbird facing each other. Back: Atomic clock. Splash crown of a water drop. Watermark: None. Work by: Thomas Stebbins. Main colours: Blue, salmon-brown and orange. Signatures: Signatory (Comptroller); Thomas Stebbins (Artist). Date of issue: 10 August 2012. Printer: Atlantic Bank Note Company. Issuer: Kingdom of Time.